Verified Audit has at least 16 publications operating in locales affected by Hurricane Katrina. We will work with our clients in the region to assure that circulation figures are recorded accurately and fairly. 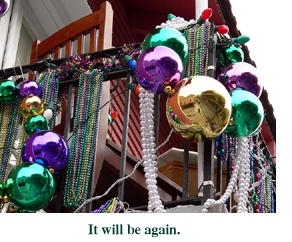 To visit New Orleans is to fall in love with a city as though it were your own. The beauty of the Gulf Coast is undeniable, and the fortitude of its residents is among the greatest in the world. Our thoughts are with them; our actions for them. This could be called the "City and Regional Magazines" edition of Verified's ViewPoint newsletter, but in addition to a few articles about exciting growth in regional publishing, we break out of the country entirely to talk about our work in Guatemala. We follow this gaggle of geographically inspired stories with two important tips on how to assure preparedness for both the audit itself and for selling the results of your audit to advertisers. City and regional magazines are a fast-growing category in newsstand sales. Some are doing so well that they are competing with or outperforming national magazines in their area. While the average sell-through rate for national magazines is 34%, the typical city and regional magazine is more than 50%. Large retailers are starting to take note. Barnes & Noble has launched a program that features regional titlesincluding Boston Magazine, Philadelphia Magazine, Florida Design and Chicago Magazinein a special fixture at the front of stores in each magazine's respective market. 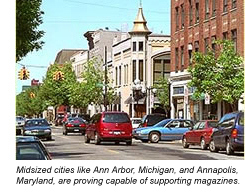 Other retailers, particularly grocery stores, are also seeing the potential of city and regional magazines. The New Jersey grocery chain Stop & Shop features New Jersey Monthly in 43 stores. Why are city and regional magazines succeeding? Experts say they tend to reach their target audiences better than some national magazines. They often have a higher penetration into a local market and reach a higher percentage of people. Editorial is targeted to the "best of" locally. So giving hometown magazines prominent space isn't just sentimental, it's good business. D Magazine is one of the most profitable magazines sold in Dallas-area grocery stores and Mpls.St.Paul Magazine has a special top physicians issue that often outperforms mainstream consumer titles in that area. Portland Monthly is the best-selling title in Portland, moving an average of 18,000 copies per issue. Comparatively, Cosmopolitan, number one nationally, sells 13,000 in the same region. Verified would like to welcome two publications from this fast-growing publishing category known as "city and regional" or "lifestyle" publications: Berkshire Living and 7x7. In 2004, Michael Zivyak levied knowledge culled from years working for Spin, Business 2.0, Glamour, and Money Magazine to launch a local magazine in the Berkshires, the rural getaway in southwestern Massachusetts for the urban burdened in Boston and New York. Berkshire Living jumped into business with a quick average of more than 70 local advertisers per issue and has a distribution plan that includes grocery stores, bookstores, and local resorts. It is also available on newsstands in New York and Boston for those "who want to take the Berkshires home with them." Like most lifestyle-oriented, regionally specific publications, Berkshire Living explores the cultural offerings, homes, outdoors, cuisine, personalities, attractions, and style of its region. 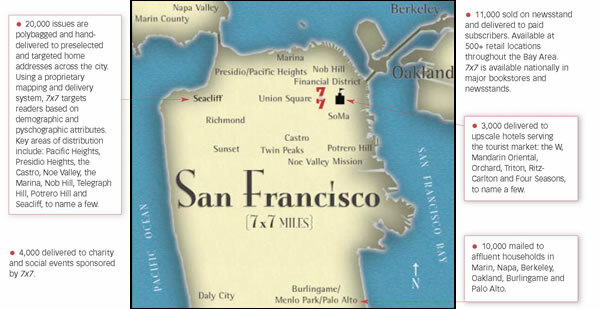 Named for the square mileage of the city of San Francisco, 7x7 is produced by a nationally recognized team of publishers, editors, and artists who have set out to produce a smart and stylish magazine for a young, affluent audience. 7x7, published by San Francisco-based Hartle Media, claims to deliver the most comprehensive food, design, and fashion coverage in the Bay Area. Articles in 7x7 are geared toward telling the story of San Francisco's most interesting people, exploring the city's innovators, designers, artisans, celebrities, entrepreneurs, chefs, socialites, performers, and intellectuals. Owner and Publisher Tom Hartle has worked for Rolling Stone, Men's Journal, and Smithsonian. Owner/Editorial and Creative Director Heather Luplow Hartle helped found Hour Detroit and has played an integral role in cultivating the magazine's award-winning design and art direction. Did you know that Verified does business internationally? In addition to clients in the United States, Verified audits newspapers and magazines in Canada and Guatemala. Claudia Elliott, Auditor, and Sindy Palencia, Account Coordinator, have both visited Guatemala on multiple occasions for Verified. This year, Claudia and Sindy were in Guatemala City for two weeks in June. 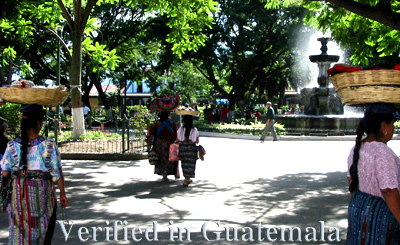 Verified has audited the five newspapers in Guatemala City since 1999. The organization which represents the Central American country's leading advertising agencies, Uni�n Guatemalteca de Agencias de Publicidad (UGAP), encouraged the newspapers to have their circulations audited. Guatemala is the largest and most populous of the Central American countries, and has an estimated population of 14,655,000. About a quarter of the people live in and around Guatemala City, the center of government. 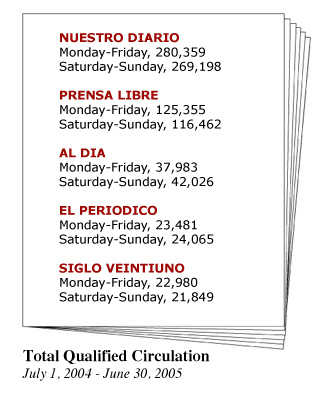 All of Guatemala City's daily newspapers circulate throughout the country. Guatemala's daily newspapers, all in Spanish, have certain practices that are quite different from daily newspapers in the United States. All of the newspapers are produced in a tabloid size, a growing trend internationally, which U.S. publishers have been watching with interest. Most include color on nearly every page, and nearly all circulation is paid, with direct-to-the-reader sales, mostly by sectoristas (street hawkers). "One of the things I found most interesting," said Claudia, "is that press run for some of the newspapers is not determined until the editorial department lets the circulation department know what will appear on the front page the next morning. This typically happens late at night and the street hawkers will then place their orders based on the front-page content. The more exciting the front page, the more copies they will order." 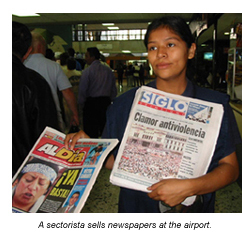 While most Spanish language newspapers in the U.S. are free, consumers in Guatemala are used to paying for their newspaper. Nearly all circulation is paid. 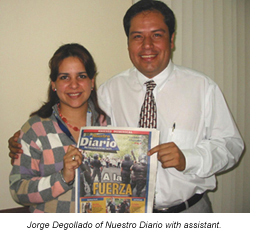 Claudia said she has enjoyed her visits to Guatemala because they have helped her realize that the business of newspapers really knows no international boundaries. She believes that U.S. publishers trying to reach a growing Hispanic population can learn from Guatemala. Sindy, who was born in Guatemala, is proud of the standard being established by her home country. "It is great to work with professional people who take their business seriously," she said. "Staff at every one of the newspapers we visited is working very hard to sell newspapers," added Claudia. "And they're growing paid circulation in a poor country with a relatively low literacy rate. Their efforts are a combination of editorial ingenuity and masterful work by circulation directors and staff. I applaud them and look forward to returning to Guatemala." Circulation audits include a review of source printing documents. Being well prepared for your audit ensures that the audit may be completed efficiently. Printing is done either in-house or outsourced to a (contract) printing company. The documents you need for your audit depend on who does your printing. For in-house printing, the audit is based on original press run reports, signed by the pressman or a supervisor. The press reports should include the issue date, total number of copies ordered and printed, waste, start and stop times, etc. A print order is not sufficient. It only shows what was ordered, not the number of copies printed. For contract printing, the audit is based on printing invoices (originals), and proof of payment. Invoices should show the printer's name, issue date, total number of copies printed, additional charges, adjustments, etc. If the charges are for a fixed number of copies (instead of the actual number printed), the invoice should still record the actual copies printed. If you receive overruns and distribute these copies, the invoice should document these extra copies. Cancelled checks (or copies of both front and back), bank statements, credit card statements, check registers along with check copies, or system generated general ledger reports (if signed and certified by the accounting department) are all acceptable forms of verification of payment for printing. It's easy to maintain complete printing records for your audit, but it takes planning and organization. The return is an audit report that increases your publication's bottom line. Circulation auditing increases ad sales and contributes to more efficient, accountable, and cost-effective circulation management. Audit reports provide persuasive, comprehensive, and authoritative analysis of your circulation, leaving no room for guesswork for advertisers. Display your audit credentials to promote your status as an audited publication. Prove that you have met the expectation that media buyers have of you. Print your auditing company's logo on your masthead, sales material, rate cards, letterhead, invoices, and promotional ads. Make your audit reports available to sales staff. Third-party verification makes your circulation claims more concrete. Explore how to best highlight the strengths of your publication by meeting with your Advertising Director and other key staff members. Your sales employees should have plenty of copies of the audit report and should know how to put it to work. Educate advertisers. Include reprints of your audit report in media kits. Use your audit report to promote your integrity and commitment to accuracy. Advertisers will recognize the extra effort you make to guarantee that their message reaches interested readers. Integrate the audit process into your departmental reviews. The audit provides a measure of the accuracy and efficiency of your internal systems, as well as an evaluation of the quality of your distribution and success in reaching your desired audience. These are just a few of the things you can do to make your audit mean more than a required piece of paper.